The guitar had its primitive origins in the ancient Near East. Clay plaques excavated from Babylonia, dated circa 1850 B.C., show figures playing musical instruments, some bearing a general resemblance to a guitar and having a distinctly differentiated body and neck. Later evidence from ancient Egypt indicates a necked instrument with marked frets about the neck. 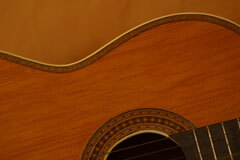 A stringed instrument from ancient Rome incorporates a wood soundboard with five groups of small sound holes. During the Middle Ages, guitars with three, four, and five strings co-existed. 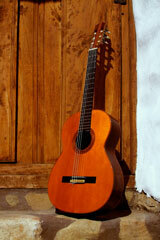 The Guitarra Latina had curved sides and is thought to have come to Spain from elsewhere in Europe. The Guitarra Morisca, brought to Spain by the Moors, had an oval soundbox and many sound holes on its soundboard. By the fifteenth century, four double-string guitars, similar to lutes, became popular, and by the sixteenth century, a fifth double-string had been added. In this period of time, composers wrote mostly in tablature notation. Italy was the center of guitar world during the 17th century, and the the Spanish school of guitar making only began to flourish late in the 18th century after the addition of the sixth string. 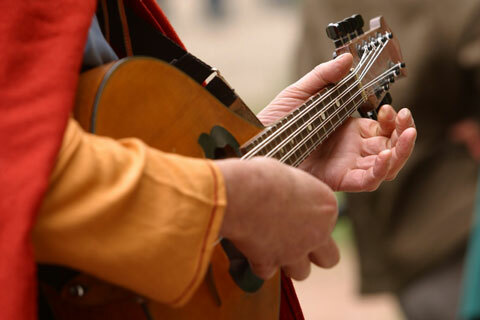 During the 19th century, improved communication and transportation enabled performers to travel widely and the guitar became a widely known instrument. Guitar music became especially popular in Spain and Antonio de Torres developed the Spanish guitar in its modern form, with a broadened body, increased waist curve, thinned belly, improved internal bracing, single string courses replacing double courses, and a machined head replacing wooden tuning pegs. While most of the credit for the early development of the acoustic guitar goes to Europeans, today's steel-string acoustic guitars were developed in America. During the early 20th century, when European emigrants were coming to America in droves, there were a number of highly skilled instrument makers among them, including those who specialized in the steel-stringed acoustic guitar. Two types of construction evolved: the flat-top guitar and the arch-top guitar. Martin and Gibson were two of the earliest — and most influential — American acoustic guitar makers. Modern guitars have six strings. Andres Segovia, a Spanish guitarist who lived from 1893 to 1987, helped establish the guitar as a concert instrument, adapting it to the complex music of modern composers and transcribing early polyphonic music. His virtuoso playing inspired compositions by Manuel de Falla and Villa-Lobos. 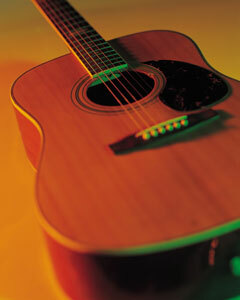 Acoustic guitars are used most often in folk and jazz music. Classical Guitar History, copyright 1998-2004 Francois Faucher.